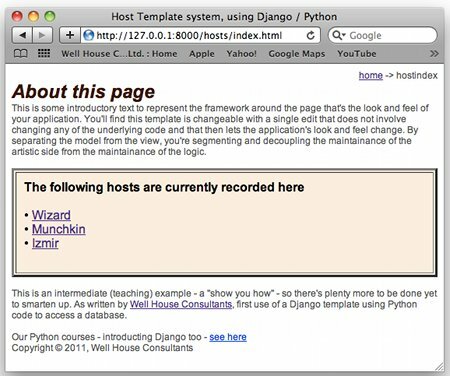 Django is a web framework in Python using DRY (Do not repeat yourself) principles. It usually uses data held in a database such as SQLite or MySQL, which is maintained separately from the look and feel of the web site. This is the second article in a series. 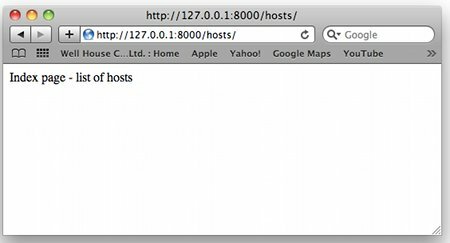 For the first article in this series - "Django First Steps" - see [here]. 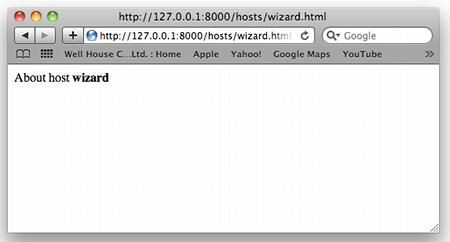 So far (in the first article) we have learned what Django is, and we have installed it with a test server. We have created a project called "oursystems" and within it a project called "nets". Within nets we have created a database table called System into which we "seeded" some test data via the SQLite utility. We then enabled the admin application that's supplied with the Django distribution, and used it to view the data held in our table (a.k.a. the model) via a browser, and to update the data too, adding, deleting and amending records without the need to know or see the underlying python, SQL or HTML. We now want to present that data prettily and with good navigability to our web site visitors, who don't care a toad's umbrella about the technology that's behind the website. You'll note that we've chosen to put the whole application under what is in effect a virtual directory called /hosts/ as this will allow us flexibility within the domain later on for other demos which can be at a sibling level, and that we're using regular expression match-and-capture to map complete patterns to a single callback method, passing in the pertinent changing bits of the pattern. 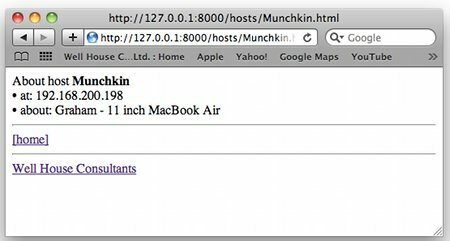 And browse to the home page, a specific system page, and a page that doesn't map. 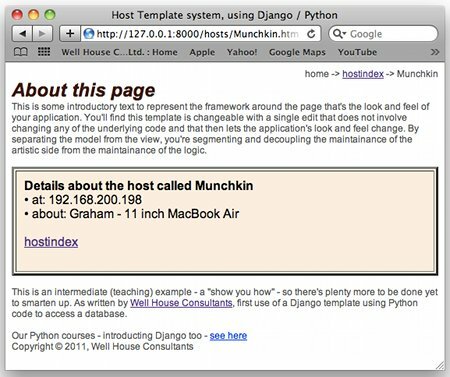 linkback = "<hr /><a href=index.html>[home]</a>"
Not only do the pages work, but we can add pages for other systems purely by using the admin application that we set up in the first section of this introduction to Django. No need for the person who's maintaining the data to understand Python. Or SQL. Or even HTML. 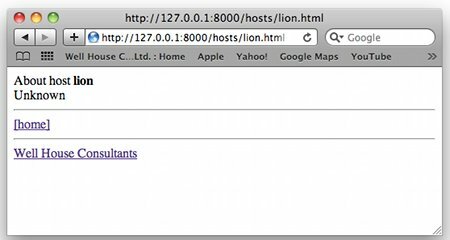 Bingo - we have uncoupled site development from data maintainaince! BUT (there had to be a "but", I'm afraid! ), the HTML is all being generated by our Python code, so we've still got the programmer and the graphic artist intermeshed within the single file. We can't easily change the look of the page to give it an "Easter Bunny" effect in April, nor can we change the data structure easily without effecting the HTML. Furthermore, the look and feel is defined in both the index and the single methods; that's not the DRY philospohy, and it's a potential doubling of work. d) ask if someone else has already written a function / method to do it and if they have, use it! And we're going to apply that classic solution here. Django already comes with a method that lets you load in a template, and another method which lets you complete that template (actually it comes with a lot more, but let's just take those two steps first. a) I'm going to take my views and separate out just the varying elements of the pages into separate variables, which I'm going to store in a dictionary that I'll use to create a Context object. b) I'm going to use a loader to find and load a template - that's a file of HTML with some extra markers in it (call it an HTML++ based metalanguage if you're really feeling geeky) which descibes the look and feel of my pages, and where abouts in them the bits that change should be placed. c) I'm going to use the render method (that someone else has already written and include as a key part of Django) to fill in the template using te context object, returning to me the HTML, which I'll then pass back to the server as my methods's response. Just three easy steps ... and indeed you'll learn that there's even a shortcut which lets you combine them later. html += '<br /><br />' + "<a href=index.html>hostindex</a>"
There a still a few patches of HTML in there - but they're all in the dynamic data areas and we'll learn in the next lesson how to move them into the template too. But overall the code is much more segmented. Now I got rather carried away here, and drew up a template that's got style sheets, tables, links, a navigation line showing where you are in the site / application. Also a copyright date ... and all the code for the changing bits is already in the Context objects just above. The complete code for the template is on our web site [here]. Other files (in the state in which they are after this final example in this section) are settings.py and urls.py. Within the nets application, we have also made changes to views.py. Significantly, we have NOT changed models.py in the work done in today's article on Django, as we have been working purely with views and have not had any cause to interfere with the model that we built yesterday. Review - where are we? We have a simple table lookup. A templated application. And amendment of table through admin. Really, that's most of what we need for a many a simple application. 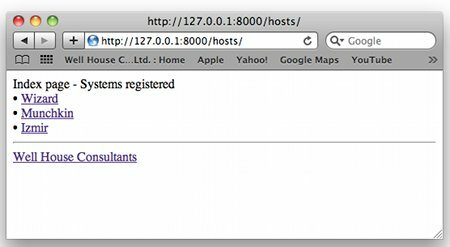 We could hide the test server behind a proxy (see here), and we should probably improve our error handler for unfound (404) pages - though that could be done by the proxy. 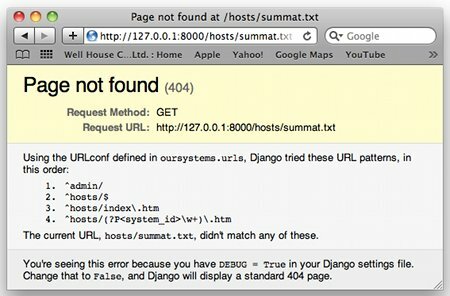 In a later article, I'll tell you how to run Django within Apache httpd which you'll probably want to do in the longer term. And beyond the minimum? What else will we often need / will help us? Those are topics I'll come back to when training; there's an introduction to Django on our learning to program in Python and Python programming courses, and an extra day is available too to cover Django in more depth - I can't tell you everything in that time, but I sure can get you well started. Articles in this series .. Step 2 -> This is the one you're reading here! Should I maintain the programming code on my own website?